[Updated] Following the death of Eugene Algernon Blakeney, the BPSU, PLP and Premier Michael Dunkley paid tribute to a man considered an icon in Bermuda’s trade union movement. The BPSU said, “The Bermuda Public Services Union received notice of the death of an icon in Bermuda’s trade union movement, Brother Eugene Algernon Blakeney, MBE, former General Secretary of the Union. 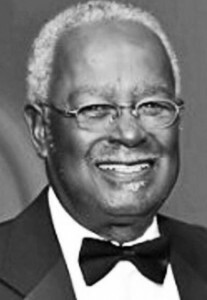 “Brother Blakeney’s guidance, temperament, global vision and understanding of people were critical to both the development ofthe BPSU and, to a wider degree, the stability of management- worker relationship in Bermuda. “Brother Blakeney’s involvement spanned the 19605 through to the 19905; a period deemed to be some of the most tumultuous times in Bermuda’s Trade Union movement. “He began as a shop steward with the Bermuda Government bus garage and progressed through the ranks to became an Assistant General Secretary and General Secretary ofthe the Bermuda Industrial Union [”BIU”] before eventually moving to the BPSU in 1979. “It was here at the BPSU that Brother Blakeney excelled; he took a group of labour neophytes and provided them with mentorship, leadership and a global perspective on progressive trade unionism. “This leadership came at a crucial period; locally, Bermuda experienced the events of the 1981 labour dispute while internationally, labour faced the Margaret Thatcher and Ronald Reagan era. “It was because of Brother Blakeney’s vision that the BPSU evolved to become one of the leading trade unions in not only Bermuda but also throughout the Caribbean trade union movement. “Brother Blakeney’s international contribution can never be overstated. Within the Public Services International, Postal Telephone Telegraph International [“PTTI”] now Union Network International [UNI], Caribbean Congress of Labour [“CCL”] and the Caribbean Public Services Association [“CPSA”], Brother Blakeney was portrayed like the advert for EF Hutton – when Brother Blakeney spoke, others listened. “The BPSU wishes to extend its deepest and most heartfelt condolences to Mrs. Shirley Blakeney and her family and wish to thank them for their support during his tenure. Their support enabled Bro Blakeley to assist our Union and serve both its members and the people of Bermuda. For that, we are truly grateful and humbled,” the BPSU concluded. Premier Michael Dunkley also paid tribute to the late Eugene Blakeney. “Mr. Blakeney is recognized as a pioneer of the modern union movement in Bermuda,” Premier Dunkley said. “He was a consummate gentleman, who brought a sharp mind and unending commitment to the development of trade unionism generally and of the BPSU and its forerunner the BPSA in particular. “In his role of General Secretary he served the Public Service admirably and the strength of the BPSU today is a testament to his legacy. The PLP said, “The Bermuda Progressive Labour Party joins with the people of Bermuda in mourning the passing of a giant in the Labour Movement; Brother Eugene Blakeney MBE. “A former Progressive Labour Party MP for Hamilton West, Mr. Blakeney is the brother of PLP MP Glenn Blakeney and served for over 20 years on the Executive of the Bermuda Industrial Union, most notably as the union’s First General Secretary. He also served as the General Secretary for the Bermuda Public Services Association [now known as the BPSU]. Update: The BHA said, “The members of the Bermuda Hotel Association and the Hotel Employers of Bermuda wish to extend their sincere condolences to the family, friends and trade union colleagues, on the news of the untimely passing of Mr. Eugene Blakeney Sr.
“Mr. Blakeney had a long and distinguished career in public service, at a time when his strength of character, and his ability to provide guidance was a much valued and admired personality trait. “Our colleagues had many opportunities to work with him over the many years of his service, with both the Bermuda Industrial Union as well as the Bermuda Public Service Association, the forerunner to the Bermuda Public Service Union.